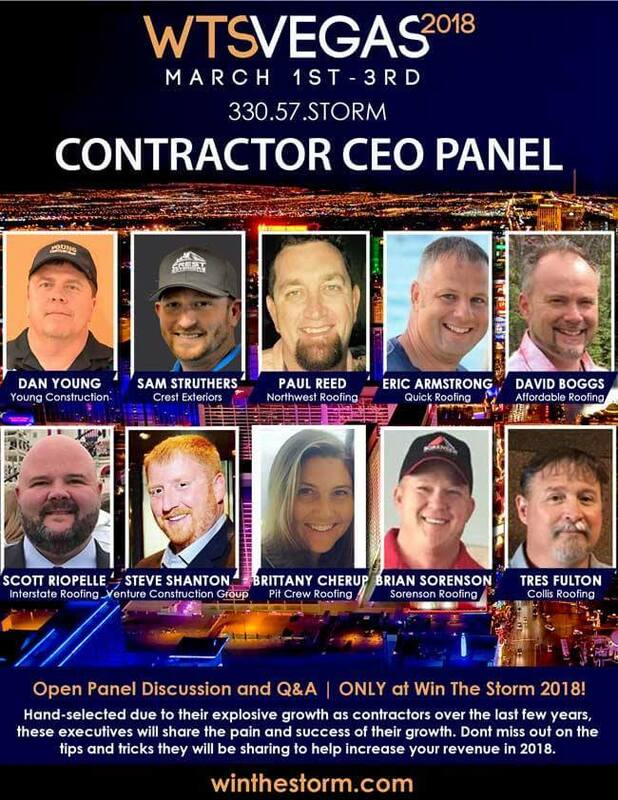 LAS VEGAS — Stephen Shanton, CEO and president of Venture Construction Group (VCG), Venture Construction Group of Florida (VCGFL), and VCG International (VCGI) presented on an expert CEO Panel at the Storm Ventures Group (SVG) Win The Storm Conference. The conference took place March 1-3, 2018 at Southpoint Hotel and Casino in Las Vegas. Shanton shared tips, strategies and advice on business development, construction and restoration best practices and how he successfully scaled three companies over 20 years to the over 2,500 contractors, suppliers, and vendors from the U.S., Canada, Europe and Australia in attendance. The CEO Panel included an esteemed group of industry business owners throughout the U.S.
Shanton has led his companies to massive success in growth, revenues, property owner education, innovation, customer service, accreditations and philanthropy. With 20 years of experience, a commitment to education and a dedication to innovation, Venture companies have earned the nation’s leading certifications and continue to stay on top of the latest trends, tools, techniques and processes. A leader in the industry, Shanton and his companies have been featured in numerous local and national media outlets throughout the nation. Shanton is a proud member of the prestigious Young Entrepreneur Council (YEC). Entrepreneur Magazine hails “YEC Consists of Some of the Most Well-Respected Minds in Entrepreneurship.” Recently, Shanton earned the Pro Remodeler Forty Under 40 Award for his innovative leadership, and his companies have earned numerous awards including the Coatings Pro Contractor Award, Qualified Remodeler Top 500 Remodelers in the U.S., Qualified Remodeler Master Design Award, and the FRSA S.T.A.R. Spotlight Trophy for the Advancement of Roofing Awards in Sustainability and Community Service. The WTS conference is an event exclusively for roofing contractors, general contractors, construction and restoration companies, fire/water restoration companies, suppliers and vendors. The conference features educational sessions, networking opportunities, and leading speakers from various sectors including construction, restoration, suppliers, technology, law, software, apps, equipment, marketing and sales. Keynote speakers included Gary Vaynerchuk, founder of Vayner Media and the DailyVee series, and Retired United States Army Staff Sergeant Travis Mills, a recalibrated warrior, motivational speaker, actor, author and an advocate for veterans and amputees. Venture Construction Group (VCG) is a leader in residential and commercial construction, roofing, renovations, restoration, storm damage repairs, and 24/7 emergency services. We are a full-service general contractor and assist property owners throughout Connecticut, Delaware, Illinois, Georgia, Maryland, Massachusetts, New Jersey, New York, North Carolina, Pennsylvania, Rhode Island, South Carolina, Texas, Virginia, Washington, D.C. Founded in 1998, VCG services commercial and residential properties throughout the East Coast, Greater Mid-Atlantic Region, Gulf Coast, and Midwest. Operational excellence is our mission in every project we undertake, and we pride ourselves on providing exceptional customer service. Venture Construction Group is an exclusive certified National Storm Damage Center Preferred Contractor, Platinum Preferred Certified Contractor with the National Insurance Restoration Council, WindStorm Insurance Network WIND Certified Umpire®, WIND Certified Appraiser®, WIND Certified Fellow®, Certified Member of the United Association of Storm Restoration Contractors, Certified Member of Exterior Insulation and Finish Systems (EIFS) Industry Members Association (EIMA), National Association of Home Builders (NAHB), Owens Corning Platinum Preferred Contractor, Mule-Hide Legacy Contractor, Certified CertainTeed Contractor and Duro-Last Certified Contractor. VCG credentials have been vetted and screened through independent third party Global Risk Management Solutions. With offices nationwide and a solid reputation throughout the country, we are able to respond to your needs with quality, ease, and top-notch service. For more information call 866-459-8348 or visit us online at www.VentureConstructionGroup.com. Founded in 1998, Venture Construction Group of Florida (VCGFL) is an award-winning leader in construction, restoration, renovations, roofing, storm damage repairs, and 24/7 emergency services throughout Florida, Puerto Rico, U.S. Virgin Islands, Bahamas and the Caribbean. Specializing in industrial/ commercial projects, VCGFL assists property managers, condominium boards, homeowner associations, association boards, hotels and business complexes with general contractor services, specialty construction, historical restoration, water and flood mitigation, and property repairs due to fire, flood, water, wind and hurricanes. VCGFL won the prestigious Qualified Remodeler Top 500 Remodelers Award, Qualified Remodeler Master Design Award, and is the proud recipient of the FRSA S.T.A.R. Spotlight Trophy for the Advancement of Roofing Awards in Sustainability and Community Service. With offices in Boca Raton, Ft. Myers, Orlando, Palm Beach Gardens, Stuart, Tampa, San Juan, and Nassau, VCGFL is committed to operational excellence and exceptional customer service. VCGFL takes care of the details every step of the way including roofing, siding, windows, drywall, flooring, paint, gutters to rebuilding properties after major storm events from hurricanes, tornadoes, and hailstorms. VCGFL carries the industry’s leading accreditations and is an exclusive certified National Storm Damage Center Preferred Contractor, Windstorm Insurance Network WIND Certified Umpire®, WIND Certified Appraiser®, WIND Certified Fellow®, Certified Member of the United Association of Storm Restoration Contractors, Platinum Preferred Certified Contractor with the National Insurance Restoration Council. VCGFL is a proud member of Insurance Appraisal and Umpire Association (IAUA), Restoration Industry Association (RIA), Property Liability and Resource Bureau (PLRB), Florida Roofing and Sheet Metal Contractors Association (FRSA), Exterior Insulation and Finish Systems (EIFS) Industry Members Association (EIMA), National Association of Home Builders (NAHB). VCGFL is a registered U.S. Federal Government Contractor and holds leading certifications including Owens Corning Platinum Preferred Contractor, Mule-Hide Legacy Contractor, Certified CertainTeed Contractor and Duro-Last Certified Contractor status. VCGFL credentials have been vetted and screened through independent third party Global Risk Management Solutions. For more information call 866-459-8351 or visit us online at www.VCGFL.com. Storm Ventures Group [SVG] is the premier catastrophic management consulting and joint venture firm. SVG is a global leader in training construction industry professionals how to help property owners recover quickly after catastrophic storm events. In 2017, SVG launched SVG University (SVG U), the first virtual online training platform for general contractors, roofing, construction and restoration professionals. SVG U includes a full course library of hands-on, engaging, industry-specific training videos with courses, chapters, and testing to help contractors scale. The SVG annual Win The Storm Conference & Trade Show Expo attracts, trains and mobilizes construction and restoration companies throughout the U.S., Canada, Europe and Australia to successfully manage catastrophic storm events, build sales teams, rebuild communities and streamline operations to scale. The SVG team brings over 25 years of experience in commercial and residential construction, insurance restoration, and best practices in construction management to the rapidly growing insurance restoration industry. For more information call 330-57-STORM or visit us online at www.StormVenturesGroup.com. To RSVP for the annual Win The Storm Conference & Trade Show Expo please visit www.WinTheStorm.com.